With the weather warming up, Frome Town Council is encouraging residents to make the most of Frome’s outdoor gym. 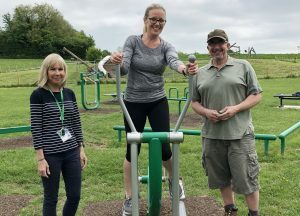 Located on the old Showfield, behind Frome Medical Practice and Frome Community Hospital, the outdoor gym is perfect for budding exercise enthusiasts or regular gym-goers alike. Frome Town Council says, “The Department of Health recommends adults do 150 minutes of moderate physical activity a week, but cost and accessibility can sometimes make this almost impossible. The good news with an outdoor gym is that it is completely free and ours has been designed to be easy to use, so anyone can give it a go. “ To help ensure everyone feels confident using the equipment, we are running introduction sessions on Mondays at 9.30am. These drop-ins are for people aged 18 or over and begin on Monday 4th June for eight weeks. After they’ve had a go at using the gym, people might also want to join a free ‘couch to 5km’ course taking place from Frome Medical Practice at 10.30am, straight after the gym sessions. You can find out more about the sessions at: https://tinyurl.com/fromeoutdoorgym. To ensure some quality one-to-one support, anyone interested in coming along to the free sessions should pre-book here: https://tinyurl.com/outdoorgymtickets.